The first time I encountered this Pork Tinuktok was 20 years ago, it was one of the specialty dishes of then famous Bonanza Restaurant in Caloocan City. The other week, a friend from the province gave us some young coconut (for gata). So my youngest son wanted me to make "Bicol Express" for dinner but my eldest son wanted "Laing". So to satisfy both their cravings, I cooked my version - the Pork Tinuktok. I prepared ground pork, salt & pepper, egg, onion, breadcrumbs, chopped green chili and wrapped it in taro leaves and cooked in coconut milk. Once they tried it, the pan was wiped clean, they absolutely loved it!. The process is like that of Tinuktok or Pinangat in Bicol, which is a mixture of minced young coconut meat, shrimps or crabs and seasonings. My version is a bit different. I used ground pork instead of shrimps or seafood, mixed with chopped long green chili (siling pang-sigang) and onion and seasoned with salt and pepper. 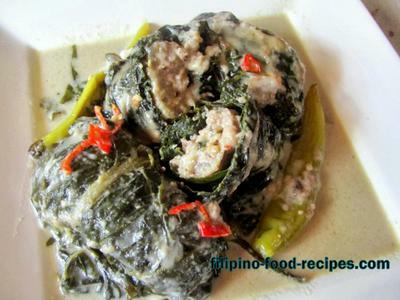 I then wrapped the meat in slightly dried taro leaves(dahon ng gabi) and cooked in coconut cream. Try and cook it for your family, I’m sure they will also love it. 1. Mix together the ground pork, egg, onion, bread crumbs, salt and pepper. 2. Wrap them in taro leaves (wrap just like making spring rolls or lumpia). Set aside. 3. Sauté the garlic, onion, ginger and shrimp paste. 4. Turn the heat down and nestle the wrapped pork in pan. 5. Add coconut milk and long green chili peppers. 6. Let it simmer until the milk is reduced to half and thickens. 7. Add the Thai bird chili (sili labuyo). 8. Add the coconut cream and boil to thicken the sauce. - It is important to sun dry fresh taro leaves to remove the 'kati' or some toxicity to it. - You can use toothpick to seal the leaves so the filling will not unravel or simply arrange them tightly in the pan without mixing or moving the wrapped meat.